The number of top-ranked Thai fighters here including Yodsaenklai, Amrani, Bovy, Anuwat, and Saiyok, along with K-1 veteran Stevelmans should make this a great and interesting show. Click here for updates. 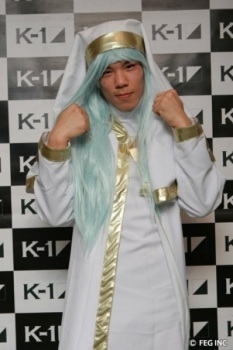 Yuichiro “Jienotsu” Nagashima has been putting a bit more focus on his training these days, and less on his elaborate costumes and entrances. Nagashima has been training at MASATO’s Silver Wolf Gym, with the legend himself. Click here for footage of Nagashima and Masato sparring. Footage begins at 6:30, with Masato in black and Nagashima in red and black. Next up for Nagashima is Xu Yan at the October 26 MAX Finals. 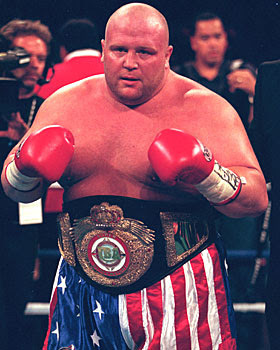 A Difficult Choice: Butterbean or an American Gladiator? The news of Mighty Mo’s opponent being chosen by vote was pretty cool, but the promoters of K-1 ColliZion have really outdone themselves now. On October 24, Romanian fighter Alexandru “Sandu” Lungu will step into the ring. Lungu, a colossal near 400 pound judoka, is perhaps best known for being KO’d by James Thompson in the dying days of Pride at Pride 30. Like Mo, his opponent will be decided by fan vote, this time between Butterbean and Jesse Smith, better known as Justice in the recent American Gladiators run. Vote now here. All I can say is, they really don’t make freak show fights like this often these days. For you fans who have a soft spot in your heart for Bob Sapp v. Akebono (and, I admit, I am one of you), enjoy. Mighty Mo has been announced for the October 24 K-1 ColliZion Final 16 event in Romania and, interestingly, fans are given the option to vote on his opponent. Mo will face either Raul Catinas, or the recently DQ’d Catalin Morosanu. Cast your vote here. Alexei Ignashov and Peter Vodracek are both confirmed for this event, with rumored participants of Sergei Lascenko and, in a rumor I find highly doubtful, Musashi. Dream also confirmed that yes, the event will take place in a cage – specifically a 6 sided whit cage, pictured above. Good news for Japan purists – this is not a permanent move. The cage will be used for one special card every year, with the rest of the cards in the normal Dream ring. I have to say, I don’t get this at all. I think fighters like CroCop proved that fighting in the cage is just not the same as a ring and that you need to come in with a different plan. So for an organization to flip back and forth seems to make little sense and be detrimental to their fighters. Now that Dream is broadcast in the US, I am guessing this is to attract UFC fans who may not like the ring, which may be a wise business move in the short term, but how will you keep those fans when you go back to the ring for Dream 13? This has an air of grasping at straws, which I hope is not the case. No Grand Prix in 2010? Japanese sports website Sponichi Annex has posted an interesting story regarding the future of the K-1 Grand Prix. According to Sponichi, starting in 2010 K-1 may move to holding the HW Grand Prix only every other year, with the years in between featuring regional qualifying tournaments. This plan would begin with just the regional shows in 2010, and the next full Grand Prix to be held in 2011. Sponichi’s information allegedly comes directly from K-1 Event Producer Tanigawa, who, even in his published comments, presents this as only his idea, and not yet a done deal. For those unfamiliar with Japanese sports media, it is important to note that their reporting is notoriously unreliable, and so this should not be considered a fact until more confirmation is available. But as far as rumors go, it makes some sense. The GP was somewhat scaled down this year, with no US tournament, and the last two qualifying tournaments announced and taking place very late in the season. No real word ever came out on what happened to the US show, but the discussion is that K-1 is facing some financial troubles and looking to save costs. This also comes on the heels of a rumor that there were troubles in the K-1 front office between Tanigawa and K-1 founder Kazuyoshi Ishii, stemming from these same financial issues. If this does turn out to be true, it would be decidedly unfortunate news, as the yearly Grand Prix is a big part of what makes K-1 unique. But again, until there is more on this story, it should only be considered a rumor. We’ll try to keep you updated on any future announcements. Tobias Alexandersson Vs Fadi Merza – Winner 3-0 Tobias Alexandersson! All fights were contested under Muay Thai rules. Good wins for Forster and Saiyok, but not much else to write home about from this card.